John Zullo is the artistic director of Zullo/RawMovement and is a choreographer, teacher, producer, curator and performer originally from the Bronx, NYC. In 2018, he initiated the Queerly Contemporary Festival for LGBTQ+ artists. Now in its second year and going strong, John reflects on the festival’s trajectory and why presenting the diversity of queer performance is important. The Queerly Contemporary Festival will take place on June 1, 2019 at the 14th St. Y in NYC. This year’s participants include Burr Johnson, Brother(hood) Dance!, Sebastian Abarbanell, Nia & Ness, Kanon Sapp, Xianix Barrera, Em Papineau and Sofia Engelman, Johnnie Cruise Mercer and Daniel Padierna. To learn more, visit www.zullorawmovement.com. Can you tell me a little about the history of the Queerly Contemporary Festival and how it came about? 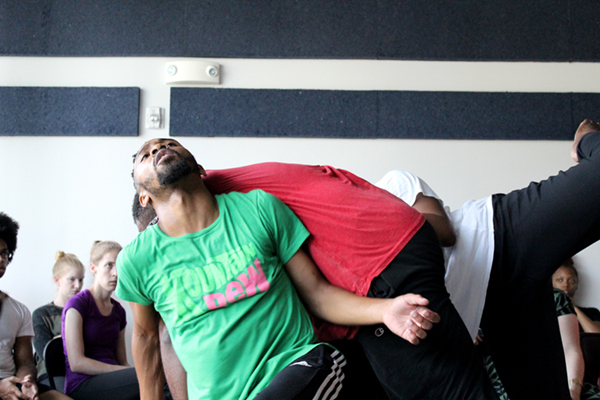 For the past few years, I have been putting on the RawMovement Lab with my company – a two-day event where I create a work and then share it with an informal audience. I was enjoying that process and decided to open it up and start showing the work of artists who I like and respect. From there, I started the RawMovement Festival at Gibney. Out of that, I became interested in producing a festival that was LGBTQ+ oriented. I felt there was a need for it, as I’m very interested in the visibility and acknowledgement of queer voices. So I put together an application and a curatorial panel, got some great responses, and put together the first festival, which was last year. I definitely knew I wanted to do it again this year; 2019 is the 50th anniversary of Stonewall and Pride in NYC, so it was a no brainer to try to take the festival to the next level. As far as my own history, I’m originally from NYC. I went to school in DC and, when I finished grad school, came back. I’ve been here ever since, working as a performer, choreographer and as artistic director of my dance company. I just finished my latest evening-length work that was presented at City College at the end of February. I’ve recently been invited to curate another queer arts festival in July, so I’m keeping busy. Why is it important to have a performance space dedicated to queer artists? 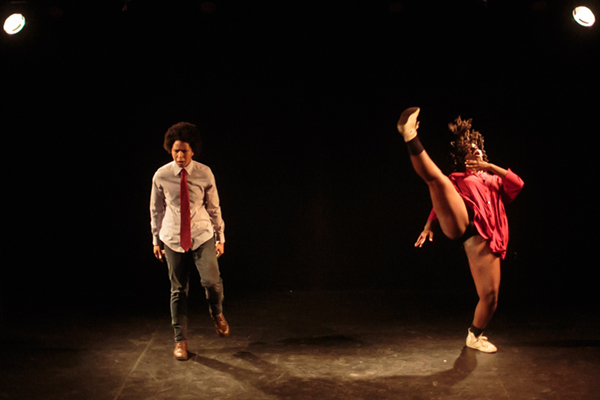 There can never be enough representation of the diversity of what queer performance and dance can be. I was interested in making the Queerly Contemporary Festival a performance series that’s not solely the perspective of gay white men even though I’m a gay white man. I was interested in seeing the diversity of what is being made by different types of queer artists. What has been really important and eye opening for me has been to find artists who I’m otherwise unfamiliar with through the application process. It’s worth mentioning that the applications don’t have to be overtly queer in their content or subject matter. They just have to be works made by queer artists. The work could be an abstract movement study or a relationship piece or a coming out story. The festival is not limited to an overtly queer context. Even I choreograph some works that are queer in content or explicit in intention, and other works that are pure conceptual movement studies exploring anything from chaos theory to architecture in space. As queer artists, there’s a multitude of voices and experiences brought to the table, and that’s what I’m interested in showcasing. There aren’t a lot of specifically queer platforms, although there have been and are other queer content festivals that happen in New York, like the Hot! Festival at Dixon Place, which I’ve been a part of. My point with starting the Queerly Contemporary Festival was connected to Pride and identity. I wanted more structure and focus on the diversity of work. A lot of organizations present queer artists, but it’s important to have it in a festival format where it’s a specific and special event in celebration of Pride. What’s the application process like to participate in the festival? The application window recently closed for 2019, and I have the same number of applicants this year as last year, between 45-50. Last year, there was a big split between cis-male and cis-female applicants. I didn’t have any transgender applicants, which I was a little bummed about, but I’m hoping this year there will be some. I did have one applicant last year who had a trans music artist as a collaborator. Most applicants are from the New York tri-state area, but I did have some international applicants. Funding plays a big part; I’m not able at this point to offer travel stipends, and the artist fee does not cover international travel costs. Last year, I had five national applicants from out of New York. Gina T’ai from Wisconsin closed last year’s festival and her piece was a great success. I have a panel of curators; it’s not solely my own perspective. I do take the privilege of selecting and inviting a few artists based on my own knowledge and interest in their work. Applicants are selected by their clarity of intent and the quality of their work sample. The panel and I must find the application dynamic, interesting and engaging. I like to find a balance between works that are more accessible and works that are genre pushing or experimental. We might have a piece to house music followed by a piece listing the names of people who died of AIDS in the 80s. I strive for a rounded-out program. The application process is open to both new pieces and repertoire. If it is a new work, I ask for rehearsal footage, even if it’s a couple minutes. The pieces must be 10 minutes or less, and we limit it to about 10 pieces in the festival. What are some things you learned from the first year of putting on the festival that you want to implement or change this year? Last year, I was the sole producer, and it put a lot of financial and logistical responsibility on me. It was a matter of fundraising and ticket sales. I didn’t want it to be a festival people had to pay to apply for. As an artist myself, that doesn’t make sense to me. Also, every artist deserves a stipend for their participation. This year, I reached out to numerous dance and performance establishments in NYC and got minimal response at first. Fortunately, I was contacted back by the 14th St. Y who were interested in partnering with me. I’m working with their educational outreach director who received a grant to put together a whole series of Pride events. Queerly Contemporary Festival will be co-presented and produced this year by the 14th St. Y and myself in their beautiful black box theater space. The festival will also have access to their marketing and resources, which will help to elevate it to the next level. Another bonus is working with their brilliant tech and lighting designer, who I’ve had the privilege of working with in the past. These are big steps in taking the platform forward. Things are already going well and we’re talking about partnering in 2020 as well. If things continue to go well, we can expand the festival beyond one evening to two or three performances, multiple programs, a master class series, and international artist participation. There are a lot of possibilities. How have you seen opportunities for queer artists change over the past ten years? Have you seen more opportunities and awareness, or has it remained the same? I definitely feel there are platforms for queer artists. It’s increased, but I’m particularly interested in opening the diversity of what types of work we are seeing. How do we find those voices if they aren’t seeing our application? I’ve reached out on social media to artists who might not have known about the festival and let them know they should apply. What’s been so cool about doing the festival on a smaller platform is that a more diverse range of people are inclined to apply. Certain big organizations are looking for artists with great name recognition. Working in a smaller and more intimate setting, I can open it up to more experimental or diverse perspectives. It’s great that those artists are getting representation. We have to ask: What are the other voices out there? Who are they? What are they doing? What do they have to say? Finding ways to offer them a platform is very important. In the times we’re living in, just bringing people together for a shared experience is so important. We spend so much time on our computers and phones, there’s a need to connect. My hope for the festival is to bring together a diverse audience pool to engage with the work of artists they might not otherwise experience. Listening to the conversations happening in the audience before and after the show is just as interesting to me as watching the performance. The festival is followed with a reception showing the work of two visual artists in the lobby. 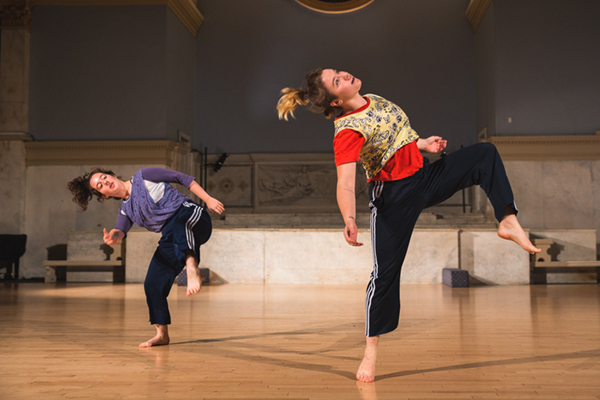 The Queerly Contemporary Festival kicks off a whole month of Pride events at the 14th St. Y, including family programming, movie nights, and a story-telling series. It culminates with the Pride Parade, and the artists in the festival are invited to march with the 14th St. Y in the parade. It’s going to be pretty awesome.